Sunday was the first day of Spring. And since it is pouring and cloudy in Seattle, it feels like we’re right on track. Despite the typical Seattle spring weather, my first-day-of-spring-dreams usually consist of picnicking with charcuterie, caprese and, always, rosé. If I’m feeling extra festive, maybe I’ll wear a floral sundress and strappy espadrilles, similar to what an allergy-sufferer would wear in a Claritin commercial. I actually wouldn’t wear that. Not really my style. But, caprese and rosé are completely my style. Any time of year. Right now rosés are being released in abundance. And “Rosé All Day” t-shirts are being worn with wild abandon. And bros are hashtagging #brosé. 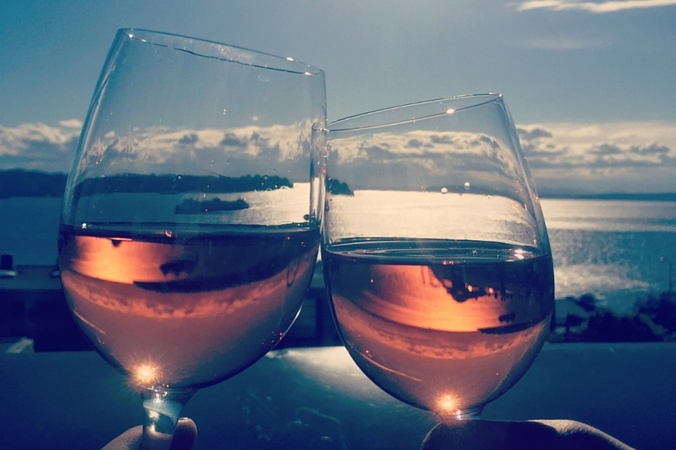 Hop on the bandwagon and drink yourself some rosé. So how do you pick a bottle? Rosé is meant to be drank when it is young and fresh, when it is still lively and acidic. 2015 vintages are your best bet. So reverse everything you know about buying wine and drink the newest stuff you can find. Your tongue with thank you when you have a mouthful of that young’n. Sometimes you’ll see salmon pink, sometimes hot pink and sometimes magenta rosés, a decision made by the winemaker. The color is determined by how long the wine sits on the skins during fermentation. The longer the wine has skin contact, the darker the pink color and the more full-bodied and tannic the wine will be. Pro tip: the lighter the color, the drier and less sweet it will be. The darker it is, the sweeter and more fruit-forward it will be. Just like a red or a white wine, rosé can be made from any red grape. You’ll find Napa rosés are typically Cabernet Sauvignon. Rosé from Provence (the home of rosé) are typically Grenache. You’ll also find Pinot Noir, Syrah, Sangiovese and Mourvedre. Just like their red wine counterparts, Cabernet Sauvignon rosé will bigger, bolder and more tannic. Grenache rosé will be dry and minerally and Sangiovese rosé will be tannic and peppery. Want something dry? Look to Grenache, Sangiovese or Cinsault. Want something sweet? Look to white zinfandel. My best advice: Try a few. Pay attention to the grape, color and location you like best. Then, buy more of that… by the case. And if you don’t want to pay any attention to this. Buy a rosé from Provence. You won’t be disappointed. When the sun starts to show on a regular basis, cherry blossoms start to bloom, birds chirping wake you in the morning and every other one of those cliché springtime signs peaks out from behind the clouds, you know it is Rosé season. And that is reason to celebrate. Even if those birds give you gas and cherry blossoms make you gag, you can celebrate, because, Rosé! And the best Rosés are inexpensive, easy-drinking and ready to start the party! 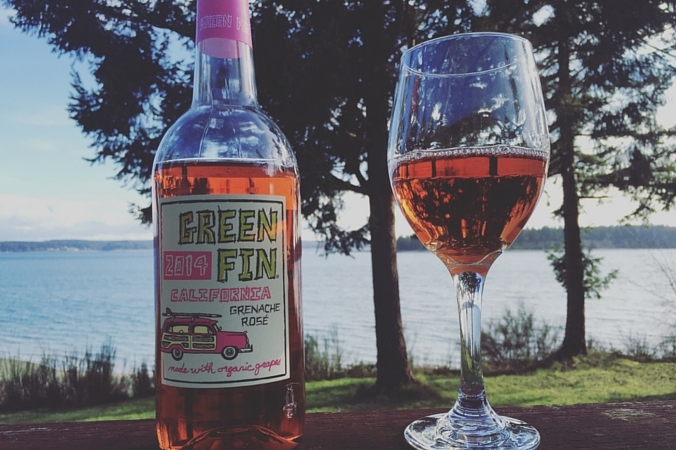 So when I was stocking up at Trader Joe’s for a weekend at the Washington coast this bottle of Green Fin Grenache Rosé seemed like a natural fit. That car on the label, the plastic bottle that wouldn’t break on the drive, the $5 price and the easy screwcap. I was sold. The wine is organic and the labels are made from recycled paper, so you can also feel good about the environment while drinking. Raspberry, cherry, strawberry. It’s not overly sweet and not overly acidic. For five bucks, it’s easy-drinking, simple and fun. And that hot pink color didn’t look too bad against the Puget Sound backdrop.